Morgan James Publishing, 9781614488170, 260pp. Sales are the lifeline to your bottom line. To succeed in sales, you need to do the opposite of selling. Most organizations today realize the economy has brought on a shift from selling during the boom times to attracting, engaging, and empowering the new economy of buyers to buy. One absolute fact is that traditional and consultative sales methods no longer work. Businesses are experiencing slower sales, sales cycles are too long, sales professionals lose control of the sales process, and businesses' bottom lines are behind projections. Yes, you can increase your bottom line while shortening your sales cycle; you can be in control of the sales process while building and maintaining relationships that will become your secondary sales force. Without buyers there are no sales, no revenue, no organization, no jobs. But buyers are everywhere. What are you doing to help them buy? 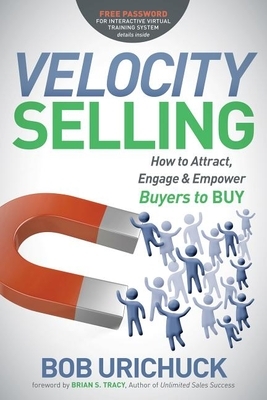 Bob Urichuck is an internationally renowned "velocity selling" specialist. With over forty-five years of sales experience, ranging from door-to-door sales to corporate high-value boardroom sales, he has accumulated a wealth of experience in selling to individuals and big corporations. For the last sixteen years, he has inspired, educated, and empowered Fortune 500 companies and midsized businesses to increase the velocity of their sales while strengthening their bottom lines. Using Singapore, Dubai, and Ottawa as his ongoing hubs, Bob has spoken in more than fifteen hundred cities in over forty-five countries to audiences of up to ten thousand people. He has been recognized as Consummate Speaker of the Year by Sharing Ideas News Magazine and ranked in the top ten since 2008 in the World's Top 30 Sales Gurus.